The Wonders of Rose Water! - Amphora Aromatics Ltd – Supplier of pure essential oils and aromatherapy Products. The Wonders of Rose Water! Our bestselling floral water; rose water is a hydrolate meaning it is the water recovered from the steam distillation of rose oil. 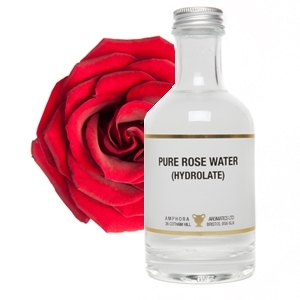 As with most floral waters, Rose Water works wonderfully as a natural toner for the skin. Simply use a cotton pad to gently wipe over the face and neck to help close the pores after cleansing. Alternatively, you can use a spray bottle to carefully spritz over the face (ensure you close your eyes!) and gently wipe away with a cotton pad (this can be a lovely way of cooling the skin during the warmer summer months!). Rose is renowned for its rejuvenating properties; using Rose water on the skin can help strengthen the underlying small capillaries in the skin, helping improve the tone and texture of your skin. On top of all this, its beautifully delicate, floral scent will help you feel uplifted and restored; promoting an all-round sense of well-being that you just wouldn’t’ get from your conventional, chemical laden toner! Top tip: You can even try mixing Rose Water with natural clays to create your own face mask! Rose Water is the ideal base to create your own homemade linen sprays and room fresheners. Simply pour into a spray bottle and add essential oils to create your own personalised home fragrance! Other floral scents such as Lavender and Geranium will work wonderfully alongside it! Relaxing, restoring, calming and fortifying. Rose Water will help soothe and tone the skin and uplift the mind and spirits! Thank you for reading - stay tuned for more tips, advice and information!